As you probably already know, back pain is a very common complaint. About three in four adults will experience back pain during their lifetime—and that number may very well rise, given our aging population and recent trend of obesity. Among people seeking back pain relief alternatives, most choose chiropractic treatment. About 22 million Americans visit chiropractors annually. Of these, 7.7 million, or 35%, are seeking relief from back pain from various causes, including auto accidents, sports injuries, and muscle strains. The goals of chiropractic care include the restoration of function and prevention of injury in addition to back pain relief. Chiropractic care is a back pain treatment alternative that aids in relieving its symptoms at their source. If you’ve been suffering from back pain, Fort Myers and Naples Chiropractor, Dr. Jason B. Kaster can offer relief. Dr. Jason B. Kaster, Chiropractic Physician, utilizes hands-on manipulation and other treatment alternatives to restore mobility to structures restricted by injury brought about by trauma or repetitive stress. The idea of chiropractic is that the correct alignment of the body, particularly the spine, enables the body to heal without surgery or medication. Why should you choose Chiropractic for Back Pain? Chiropractic care is gaining popularity worldwide due to its treatment advantages. More and more people are seeking chiropractic care for back pain. Studies reveal that chiropractors showed greater improvement and satisfaction compared to patients treated by physicians. A higher proportion of chiropractic patients (56% vs. 13%) reported that their back pain was better or much better. 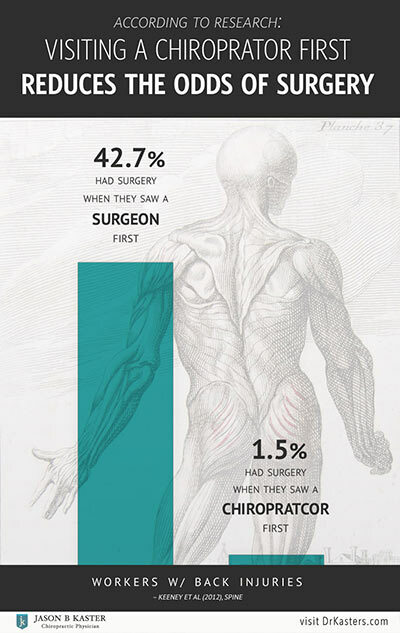 Another study observed that there were reduced odds for having surgery for those whose first provider was a chiropractor. Acute pain is defined as pain lasting from a few days to a few weeks. Its cause is usually mechanical in nature (a disruption in the way the back’s components move). Acute back pain usually resolves on its own. Chronic pain on the other hand, is defined as pain that lasts for 12 weeks or longer. Pain continues to be experienced even if the underlying cause of acute pain is treated. Nonspecific back pain is the most common type of back pain. It is called nonspecific because the cause of pain is usually not clear. The severity of pain may vary from mild to severe. Referred pain tends to move around and vary in intensity. It is characterized as dull and achy and may radiate from the lower back to the upper thigh. Degenerative disc disease is an example that may cause referred pain to the hips and posterior thighs. Radicular pain is caused by compression, irritation or inflammation to a spinal nerve root. It is often described as deep and radiating through the extremity (arm or leg). The pain experienced in the extremity is often worse than the pain in the back. Presence of numbness, tingling or weakness may be observed. Radicular pain is also known as Sciatica. The causes of back pain can be complex. 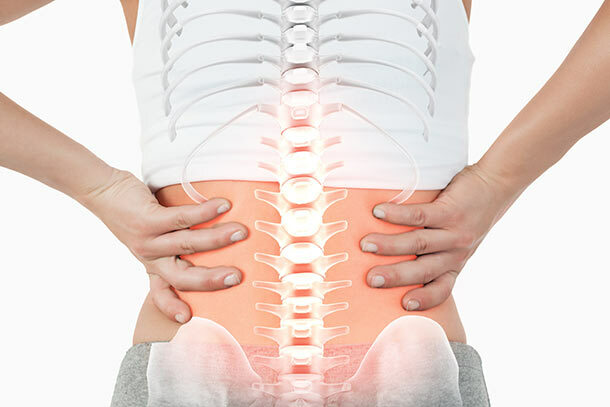 Some causes of back pain include accidents, herniated disc, muscle strains, and sports injuries. Incorrect body mechanics during lifting, twisting, or ballistic movements can cause muscles and/or ligaments to develop microscopic tears, which result in back pain. There are also causes of back pain that are not related to trauma like poor posture, excessive weight, lack of exercise, limited flexibility, and poor workstation set up. Keeping your back strong and flexible is the best way to avoid getting back pain. Cases of recurring back pain are often preventable by avoiding movements that strain the back. Regular exercise, maintaining good posture, and lifting correctly will all help. We need to stretch and strengthen our core muscles to stabilize our trunk. Rest – Allows the injured structure time to heal. In return, it will help relieve back pain. Ice/Heat – Application of a hot and cold compress can aid in decreasing inflammation. Some people prefer hot more than cold (and vice versa). But, you can also apply both alternately. Exercise – Strengthening and stretching exercises are some of the prescribed managements for the treatment of back pain. The top goals of these exercises are to stabilize the trunk (mostly the abdominals) and increase the flexibility of the spine. Chiropractic/Spinal Manipulation – A common therapeutic treatment that applies manipulation to the vertebrae that have abnormal movement patterns. It decreases pain and inflammation that results to improved spinal function. Massage Therapy – This type of treatment improves blood circulation and promotes relaxation to the muscles. Massage also increases endorphin levels that will make you feel good. Medications – NSAIDs are one of the most commonly prescribed medications to decrease the symptoms of back pain. These medications usually target inflammation while others inhibit the transmission of pain signals to reach the brain. However, don’t become dependent on these medications because they may induce side effects such as nausea, vomiting, addiction, and can impair your kidneys in the long run. Epidural Steroid Injections – A method that delivers steroids directly into the painful spot. As we all know, steroids help reduce the signs of inflammation, and thus, provide pain relief and improved physical function. Potential risks like infection, nerve damage, bleeding, and dural tap may arise afterwards. Surgery – This method would be the last resort should all conservative managements fail. It is primarily the patient’s decision if he/she are willing to undergo surgery. The type of surgery will depend on the type of back pain and its causes. But, you have to keep in mind that not all surgeries are successful and complications are inevitable. Some still experience back pain after surgery. Chiropractic care is a safe and effective treatment for back pain. The theory behind the success of chiropractic is that realigning the spine results in restoration of natural nerve functions throughout the body. Recent studies have shown that chiropractic patients have a faster recovery time compared to other treatment alternatives. Are you, or anyone in your family, in need of a Fort Myers or Naples Chiropractor? Dr. Jason B. Kaster is an experienced Chiropractic Physician who serves Fort Myers FL, Naples FL, and the surrounding Lee and Collier County communities. Stay Updated on Events in Fort Myers and Naples, FL! Get information about healthy living, Chiropractic and specials. Our goal is to not only alleviate pain, but more importantly, inspire and educate our patients to become active participants in their own well being. Need To Report An Accident?